New Zealand writers are not really spoilt for choice when it comes to fellowships and residencies. There are a number of well-established and well-endowed residences, usually associated with universities and a couple of prestigious overseas possibilities – the Katherine Mansfield Menton Fellowship in the South of France and the Berlin Writer’s Residency. 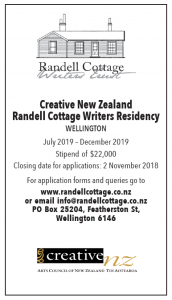 One of the most singular and attractive residencies, however, must be that run by the Randell Cottage Writers Trust in Thorndon, Wellington. The fellow is offered six months in a charming cottage in St Mary Street off Tinakori Road to work on a given project. There is a stipend and the cottage is rent-free. 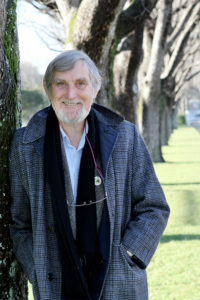 The Trust itself was formed in 2001 and the cottage opened its doors to writers in 2002, the inaugural writer being Peter Wells. Before me, there have been 33 writers to date and I am utterly delighted to be the 34th. Many things make this a distinctive residency. Perhaps the most obvious is the French connection. For one half of the year the W.I.R. is a French writer, and a New Zealand writer has the other half. The funding reflects this: a partnership supported by CNZ, the New Zealand France Friendship Fund and the Embassy of France and added support coming from the Wellington City Council and the Friends of the Randell Cottage. Then there is the cottage itself. It is a rare experience to spend your days and nights in a beautifully restored work of history. The house dates from 1867 and there is a plaque on the outside wall to verify this. It was originally built and owned by the Randell family who raised ten children here. The current house has larger dimensions than the original built by William and Sarah Randell, as in 1875 an extra two rooms were added to the south side to accommodate the growing family. Apart from a lean-to beside the kitchen the dimensions have remained the same ever since, although the disposition of a couple of the rooms has changed with the front bedroom (three girls) becoming a living room (and a most comfortable writing room) and smaller side bedroom (boys) becoming the bathroom. Originally, the bathroom, lavatory and washhouse were in an outhouse separate from the cottage. According to great-granddaughter Beverley Randell’s history of the cottage and the family, A Crowded Thorndon Cottage, the Randell’s had seven children when they moved in, including baby Richard, and three daughters afterwards. I find the cottage remarkably spacious, but then I would. In the 1870’s twelve people lived here! In the early 1990’s, Beverley Randell, her husband the publisher Hugh Price of Price Milburn and their daughter Susan Price, repurchased the cottage and had it lovingly restored to as close to the original as modern convenience allowed. They gifted the cottage to the Trust to allow for the residency. Trust member Sian Robyns told me how the Price family went to great pains to decorate and furnish the cottage appropriately. She said they scoured the lower North Island to find pieces of furniture, fittings, even hunting down appropriate wood for repairs to moulding and flooring. The results of these efforts are lovely. When you can stand in the large kitchen and look to your left, you are transported back a hundred and fifty years. A Victorian glass panelled door with a round polished wood door handle opens into the lean-to. Beside it stands a sideboard bearing willow-pattern china – milk jugs, sauce jugs, cups, saucers, plates and bowls, and beside the sideboard a neatly blackened Shacklock Orion coal range with an iron frying pan, a couple of flat irons, an iron saucepan and an iron kettle. The walls are covered in replica Victorian wallpaper: very floral, very busy and very pretty. If you turn to your right, though, you will see a refrigerator, a stainless steel bench top and sink, an automatic dishwasher and an electric range. This is the pattern of the cottage. Loving Victorian detail: polished kauri and rimu woodwork, cane furniture, wing chairs, fumed oak dining chairs, Turkish style rugs on wooden floors, and prints of colonial Wellington on the wallpapered walls. All of this in the midst of heat pump and broadband, microwave and HP Office Jet Pro. My bedroom is a case in point: a magnificent iron bedstead with brass knobs (I always longed for brass knobs) with, not one, but two Victorian-style quilted counterpanes (there is another on the single bed in the spare bedroom), but also an electric blanket of toasty efficiency. All of this makes for very comfortable living. As it happens I am writing a novel with a dual narrative – one storyline set in the nineteenth century, the second contemporary. It has just occurred to me how wonderfully appropriate it is to be living in the Randell Cottage while beavering away at this. Such serendipity. The final advantage of the cottage is its locale. The narrow valley down which Tinakori Road runs is not recommended for its sun and, although the cottage is sunnier than I expected, St Mary Street is steep and on the ‘wrong’ side of the road for sun. Despite this, the immediate neighbourhood makes for very pleasant living. Directly opposite are the Wellington Botanic Gardens with their walks and natural delights. Up behind, the rather more strenuous walks of the Te Ahumairangi Hill will take you in all directions, mostly including up. I made it to the lookout after a morning of heavy rain, and – when my shoes dry out – will try it again. It is a short walk to the city itself and not too far to the supermarket. Jacinda, Clarke and Neve Te Aroha are close neighbours although I’ve yet to drop in. Tinakori village seems mainly to comprise eateries and antique shops, so ideal if you develop a taste for food or for Victorian living. I have a writer’s superstition about waxing on about work in progress. Suffice it to say, from my point of view it’s going splendidly. How could it not? The Randell Cottage is a perfect writing environment, peaceful and quiet with wrap around comfort, utterly charming setting and supported by a team of very helpful, friendly trustees. I feel very fortunate and very grateful.